It’s not a secret that I engage in a dark and unnatural kind of hero-worship for Penny Arcade’s Jerry Holkins and Mike Krahulik. If you want to participate, I meet in the forest outside the city limits every Bumpsday night. It’s a strictly bring-your-own-black-robe event. But I feel justified in that, those two started out with a webcomic and now have pretty much everything you can imagine under the Penny Arcade brand except an independent country. And last I heard, they were working on that. 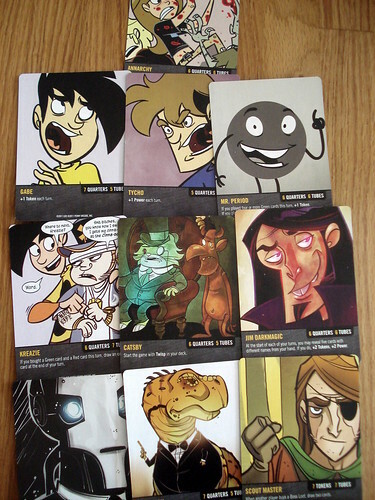 Among the things they have is a line of boardgames published by Crpytozoic, starting with Penny Arcade: Gamers vs. Evil. The first expansion, Penny Arcade: Rumble in R’lyeh was released very recently while the first game independent from that line, The Lookouts, still has no official release date. Penny Arcade: Gamers vs. Evil is a deck-building game with only minor surprises. As usual for the genre, you start with a fixed deck. Every round you draw six cards and, when it’s your turn you play as many of them as you like, usually all of them – a key difference to the one deck-builder that everyone knows and use them to buy new cards. Played cards, new cards and the cards remaining on your hand, if any, go to the discard pile. Then you draw fresh cards and wait for your next turn. Your starting deck consists only of the two basic currency cards – Quarters, giving you one token each and Cardboard Tubes, doing the same with power. (The cardboard tubes make perfect sense if you’re familiar with the Penny Arcade comic. If you’re not, you’ll just have to trust me on that.) There are indeed two different currencies in the game which you use to purchase different cards: tokens buy you green Gamer Cards, with power you conquer red Evil Cards – the distinction doesn’t make a difference for the game, both kinds of card are added to your deck. The evil cards, in addition to their function when played, also count victory points in the end, but that’s the only difference. Your starting mix of Quarters and Cardboard Tubes depends on the character you play: Penny Arcade, Gamers vs. Evil lets you have an avatar in the game. Your character also give you a special ability that, unfortunately, makes some characters much easier to play than others. Tycho and Gabe, for instance, let you have +1 Power or +1 Token every turn – that’s a very powerful ability, and one that it’s easy to build a strategy around: concentrate on the type of card you have the bonus for. Other characters start with special cards in their deck that are more powerful than a simple +1, but also rely more on luck to have them together with other cards that make sense. Hardest to play and most easily brought down by the bad luck of the draw are Mr. Period and Kreazie. 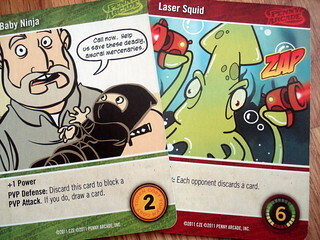 Both characters’ abilities are tuned for mixing gamer and evil cards. But as gamer cards mostly give you tokens again and evil cards give you more power, this approach often leads to a split hand – having some gamer and some evil cards – that makes it hard to buy the more expensive cards. The cards you add to your deck are, of course, at the heart of the game. Many cards simply add to your tokens and/or power when played. Some have a straight-forward constant bonus, others change in value depending on other factors. The Pickle-Recognition Engine, for example, is worth +5 Tokens if the top card of your deck is green and only +1 otherwise. It pays you when it recognizes a pickle. Brilliant machine, I want one in my kitchen. Magic: The Gathering players all over the world are now rubbing their hands with glee, thinking something like “so lets make sure there is a green card on top”. All you guys can exit planning mode again, the only way to ensure that the top card is green is to only have green cards in your deck, there are very few chances for deck-manipulation. Even drawing additional cards, a staple ability in Dominion, is rare here. Admittedly, it’s also vastly more powerful because you can play all your cards. The only fairly common way to modify your deck is deleting cards, meaning you remove them from your deck never to be seen again. There is also a bunch of cards labelled as PvP Attacks (PvP means Player vs. Player and is commonly used in computer games) that do bad things to your opponents. Most attacks either force their victims to discard a card or to take a PAX Pox, a completely useless card worth -1 point. To protect yourself from such perils you can use PvP Defense cards that block an attack. I enjoy the mental image of an army of Laser Squids and Giant Snakes, backed up by a cauldron of Evil Gumbo, nuking it out with my bodyguards: Baby Ninjas and Robot Cowboy Angels. Those names are, by the way, the real deal. I couldn’t make those up. Penny Arcade readers will find them hilarious, but when playing with non-believers your mileage may vary. I’m sure everyone loves a Werewolf with a Top Hat, how could you not? The same goes for the Fairy Candymancer. Other cards are fun for fans only – who else would know the Witchalok? – or at least for people who share the comic’s surreal sense of humor. The Pickle-Recognition Engine. And then there’s the cards that may drive some people away by insulting their delicate sensibilities – not anyone I’d play with, fortunately, but it might happen. I’m looking at you, Scrotuum, the testicle-shaped alien, demon … whatever that thing is, just get it away from me! The cards are much more enjoyable for insiders, for sure, but they are all gorgeously illustrated in the comic’s typical style, something we certainly can agree is a good thing. Except Scrotuum. The last detail that sets Penny Arcade: Gamers vs. Evil apart from other deck-building games are the boss fights. Penny Arcade is still primarily concerned with computer games, and virtually every good computer game has boss fights. (Conversely, every computer game can be improved by adding boss fights: a boring football simulation, for instance, would immediately become awesome if you had to defeat the giant demonic cyborg goal keeper before you can score. But I digress.) Gamers vs. Evil has bosses to fight, and like every self-respecting boss they drop loot. Each side has one boss in every game: the Cardboard Tube Samurai or Jolly old Saint Nick for gamers, Satan or the even more evil Dark Tycho for evil. To attack a boss you need eight of the respective currency – the most expensive normal cards cost six – and win a boss loot that is added to your deck like every other card. After four loot cards are taken, the boss levels up and it now costs 10 to defeat him, after four more loot cards he levels up a second time. The level three boss needs 13 power or tokens to defeat, but besting him ends the game. Boss loot is, to say the least, powerful, often to the point that drawing a boss loot card to your hand will make it easy to buy another loot card. Especially the gamer loot cards are often guilty of this because they can produce a critical strike based on a die roll, doing something ludicrous like doubling all tokens and power you played this round. Being the first player to buy boss loot is a good first step to victory. 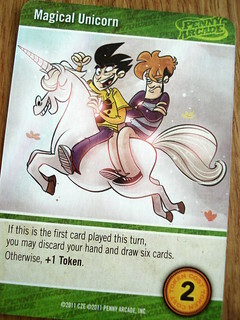 There is a lot of randomness in Penny Arcade: Gamers vs. Evil. Compared to other deck-building games, you’re much more dependent on luck, starting with your character card, going through the luck of your hand draw – okay, that’s in other games as well – and ending in the random effects of many cards based on die roll or the colour of a card draw. You also make less and easier decisions than you might be used to. The main decision is which cards to buy, no one will take that from you, but many turns you don’t have to decide which cards to play at all, you just put them all down and proclaim “With my army of testicles, I shall attack Satan and take his loot!” That’s an actual quote. I’m not saying there is no strategy at all in what you do with your cards, but it’s less than in other games from this genre. It’s not very thinky and it does have some balance issues, but Gamers vs Evil is still a boatload of fun, just don’t think too hard about it.